At the conclusion of the war, an officer belonging to the 2nd Australian Signal Troop produced an unpublished manuscript in 1919 called 2nd Australian Signal Troop, which included a section specifically related to the battle of Beersheba and is extracted below. On the evening of the 30th October 1917, the whole Anzac Mounted Division, moved up towards Beersheba. The Anzac Mounted Division cable wagon, which was following the column, was laying the wire as the 2nd ALH Brigade moved along. 2 miles south of Amara, the 2nd ALH Brigade, halted to allow the 7th ALH Regiment to go ahead to clear the place of the enemy. One pack set went along with them with sufficient wire to lay to their objective. Upon the post being found clear of the enemy, the 2nd ALH Brigade, pushed forward till 0700, when a short halt was made for breakfast. 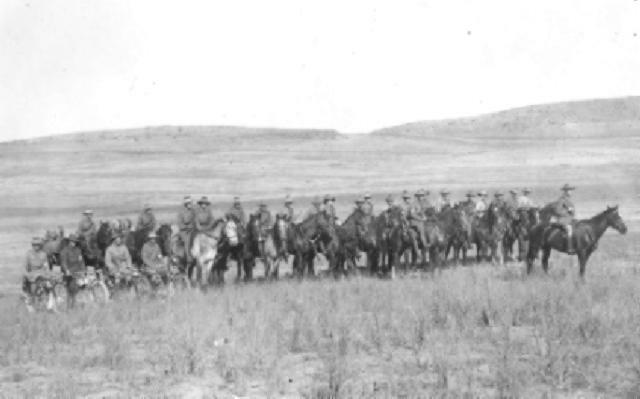 We pushed forward at a hand gallop at 0730 eventually taking up a position for Headquarters, about 5 miles north east of Beersheba and 2 miles east of Sekatia. Visual communication all day with Anzac Mounted Division, and Regiments. The work with Divisional Headquarters, was very heavy, until sundown, a lamp was then brought into play, but although we called all night at regular intervals no reply was received. The wireless was erected but was unable to raise Anzac Mounted Division. Telephone communication with 5th and 7th ALH Regiments. (6th ALH Regiment in reserve). Next morning (1st November) a line was laid from Divisional Headquarters, they having established their Headquarters at Tel el Saba. The 6th A.L.H. Regiment moved out further across the Hebron Road, and the line was extended to them from the old Regimental Headquarters, of the 7th A.L.H. Regiment. Visual common. with Anzac Mounted Division, and Imperial Camel Corps Brigade along the hill tops directly north of Beersheba.